It has been a wild and crazy winter. Lots of much needed rain has at times kept us inside for days! With March comes the time change and longer days, along with the first day of Spring on March 20th. 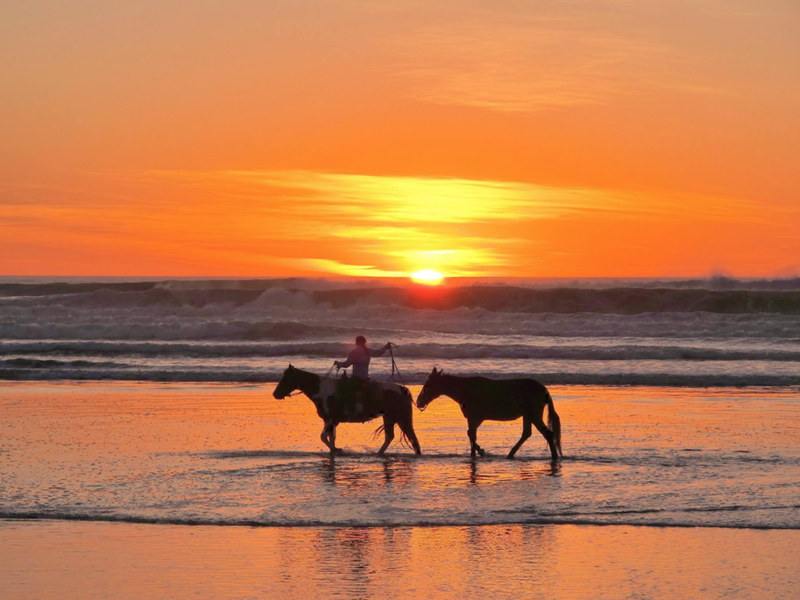 There is so much to be celebrated as Spring is upon us here in San Luis Obispo County. Truly, one of the most splendid times of year here on the Central Coast. The hills have been gorgeous deep shades of green filled with lush grasses as they revive from the Winter frost. Just waiting to explode from the suns warming rays as the temperatures rise a bit, a full array of local wildflowers! The last “super bloom” was in 2017, and we are sure this year has so much in store for us. Beyond poppies and blue lupine that you will find more readily along our highway hillsides , explore deeper in the county by visiting two of our favorite wildflower viewing locations. Shell Creek Road off Highway 58 shows a display of Baby Blue Eyes, yellow Goldfields and white-tipped Tidy Tips. Bitterwater Valley Road between Highway 58 and 46 East shows off miles of golden Fiddlenecks, deep red Scarlet Bugler and pinkish Owl’s Clover. Get your cameras ready and go explore! With Farmer’s Markets available all around the county, on almost every day of the week, it is a great opportunity to drop by and fill your basket with new Spring produce. New veggies and berries are available as the temperatures rise during March, April and May and provide that gap from the winter vegetables such as lettuce, broccoli, cauliflower and citrus. Asparagus, carrots, bean and berries add different dimensions, colors and tastes to our plate. Celebrate these new flavors! Little may one know, but San Luis Obispo County has some of the best kept secret waterfalls, and this time of year is the perfect time to see how they are flowing! One of our favorites is hidden off a road at the base of the Cuesta Grade in Reservoir Canyon. A short diversion to your right off the trail-head brings you to the 15 ft. cascade of the falls. Take a trip to San Luis Obispo County lakes to see how much they have changed over this rainy season. Take a picnic and enjoy the changing shoreline, new growth and rock formations. Both Lake Nacimiento in North County and Lake Lopez in South County are great to explore. Up for a longer trek, reserve a campsite and stay longer. It may still be a bit too cool for sunbathing, but Spring weather is perfect for enjoying the sea breeze and sunshine with a nice beach walk or saunter down the new Pismo Beach Pier. Make a day of it and stop by SeaVenture Restaurant for a tasty Sunday Menu Brunch, with outdoor seating and views, mimosas and bloody marys are calling! Stay even longer and enjoy Sundays on the Deck. Live Music from 3-6pm from local artists round out your Sunday and make it the perfect funday! Grow together with the one you love through new, exhilarating experiences throughout the central coast. Stay active and healthy this February, while elevating your heart rate and taking a few risks. All of these adventures offer the perfect opportunity, location, Instagram background for the ultimate risk ~ a proposal, or at least a perfect afternoon together! Afterall, what is love but the ultimate risk. 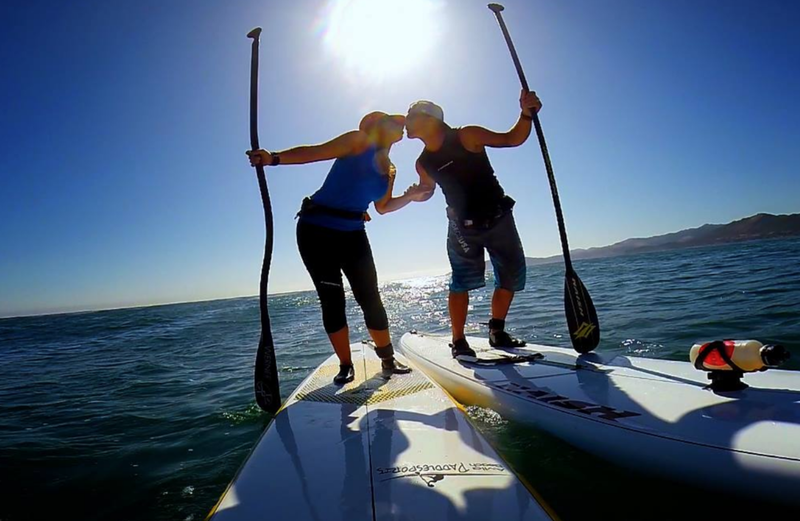 Glide through the water hand in hand with your honey, while coming face to face with otters, seals, and even dolphins! You will have quality time together while getting unique views of the coast that you just can’t get from land. Pack a picnic and take a break on a secluded beach, the perfect spot for a glass of bubbly and a romantic toast! Take your sweetheart to new heights while hiking one of the many trails San Luis Obispo county has to offer. 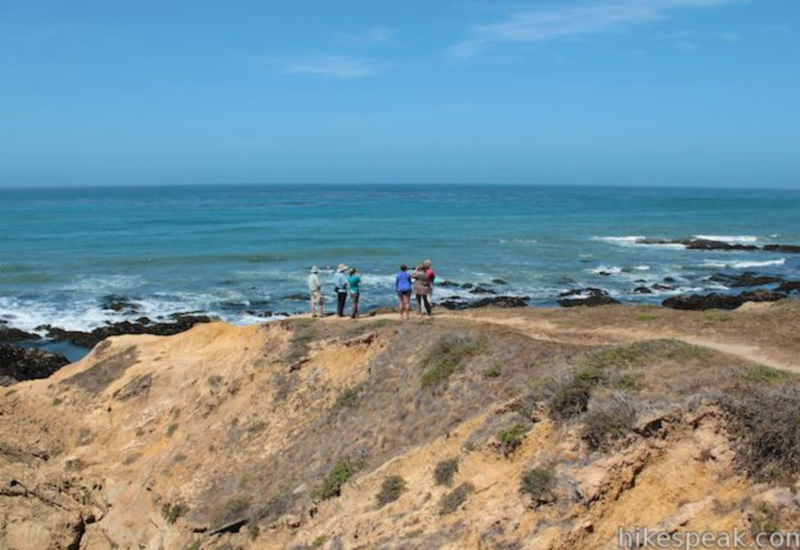 Choose from ocean view trails (like Avila Ridge just off Highway 101, Valencia Peak in Montana de Oro, Harmony Headlands off Highway 1) or select one that offers wide expanses and amazing birds eye views of the entire town (Bishop’s Peak and Madonna Mountain in downtown San Luis Obispo are amazing). With trails for all experience levels, you can choose your challenge! Other than falling in love, what gets your heart pounding, your palms sweating, and takes your breath away? Ziping through the air over valleys, oaks, and vineyards! With 6 ziplines, you have a chance to zip alone and tandem while taking in the scenery and striking your most creative poses. Top your experience off with a stop in the Ancient Peaks tasting room to sample limited edition wines and relive your adventure. Stretch your body, mind and soul with your partner at a yoga class from Sycamore Mineral Springs. You don’t need to be a guest to enjoy their variety of classes. Choose from a gentler class meant to soothe the soul or a more strenuous class which helps to increase strength and muscle tone. Which ever you choose, you will emerge refreshed and energized, a journey you can share together. A trip to the naturally heated, healing waters of Sycamore’s hot tubs is the perfect culmination to your day. Winter is here and we are hoping we get some much needed rain this year. While rainy days can put a “damper” on all of our amazing outdoor activities. We have some great indoor alternatives for your next rainy day adventure. We have two great bowling centers located in nearby our properties. Pismo Bowl is near the pier in Pismo Beach and is like stepping back in time to the 50s. Established in 1939, this 8 lane center is the perfect place to have some fun on a rainy day. 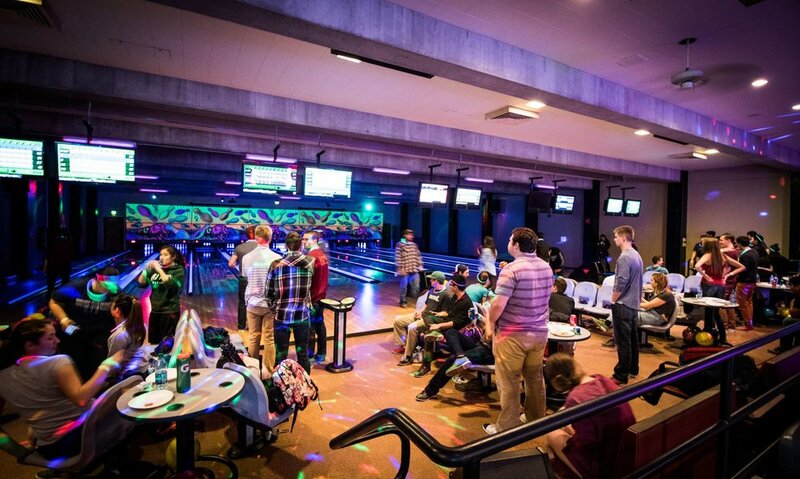 Mustang Lanes is located in the University Union at Cal Poly. Not just for students, this 10 lane center also has a great arcade. You can also reserve a lane ahead of time on their website. The Great American Melodrama & Vaudeville features rainy day fun for the whole family! They produce top-notch musicals, comedies, and classic melodramas in a lively cabaret setting. Located in Oceano, this timeless SLO County tradition has been operating since 1976. SLO has two new options for pub crawling on a rainy day. The first is Central Coast Brewing. This local staple recently opened their new location on South Higuera. It features all of their local brews plus a full menu of pub food favorites including crispy fried tater tots and pizzas. Another fun option is Libertine Brewing in downtown SLO. They host 76 taps of beer and wines from all over; including a wide variety of their own wild ales, kombucha and cold brew coffee. Be sure to try their panko fried goat cheese balls and their Mac N Beer Cheese. Rainy days are the perfect time to take part in the healing arts at Sycamore Mineral Springs’ Yoga Dome. Daily classes feature Yoga, Pilates, Tai Chi, and more. All classes are open to the public and priced per session, per person. Resort guests receive unlimited complimentary classes. After your session, head over to the one of the amazing mineral spring tubs on the property. It’s so peaceful to soak in the hot waters with the rain falling down.